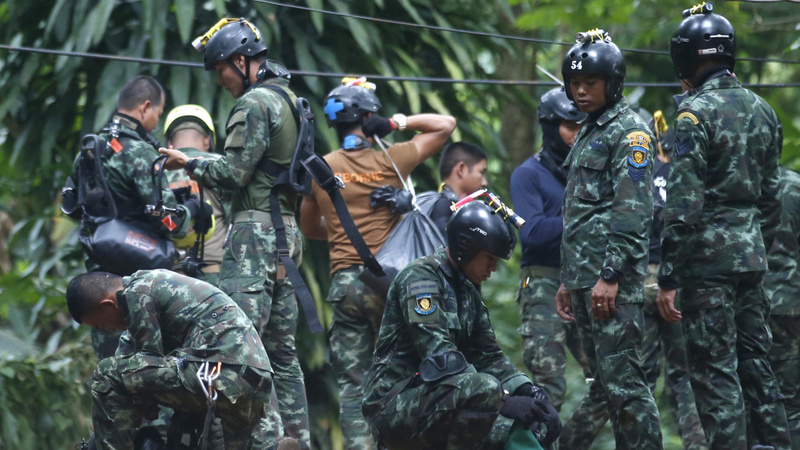 Thai rescuers prepare to enter the cave where 12 boys and their soccer coach have been trapped in Chiang Rai province, in northern Thailand Friday. A Thai diver died while on a supply mission. Saman Kunan was returning from an overnight mission placing oxygen canisters when he lost consciousness and died Friday morning, Thai navy SEAL commander Arpakorn Yookongkaew told reporters Friday. Saman was helping with the rescue mission as a volunteer. The boys have been trapped in a complex cave system in Chiang Rai in northern Thailand since June 23. The elite diver's death underscores the difficulty and complexity of attempting to rescue the 12 boys, ages 11-16, and their 25-year-old coach. Many of the boys reportedly do not know how to swim and do not have experience using scuba equipment. The journey from outside to where the boys are stuck takes about six hours, according to The New York Times. Arpakorn also told reporters Friday that time to rescue the boys is now "limited," though he did not specify the reasons. "At first we thought that we could sustain the kids' lives for a long time where they are now, but now, many things have changed," he said, according to The Associated Press. "We have a limited amount of time." Authorities had earlier considered waiting months until the rainy season ends to rescue the boys. Rescuers are reportedly also concerned about a lack of oxygen in the cave. Maj. Gen. Chalongchai Chaiyakam told reporters the most important task is to set up an oxygen line to reach the boys, the AP reports. Rescuers have been working to pump water out of the cave. But the Bangkok Post reports that monsoon rains are predicted for Sunday, "which authorities fear could re-fill the cave and reverse gains made in the mammoth rescue effort in recent days." Arpakorn told reporters, "I can guarantee that we will not panic, we will not stop our mission, we will not let the sacrifice of our friend go to waste," according to the BBC.